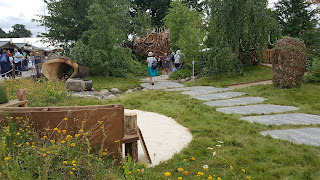 I made my annual pilgrimage to Hampton Court Flower Show last week. 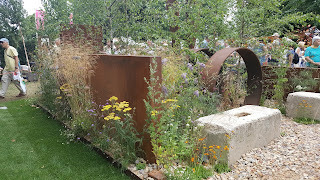 The comparatively small number of big-name show gardens was noticeable but at least partially made up for by the creativity of many of the smaller, quirkier gardens in categories such as Gardens For a Changing World, and of course the conceptual gardens. Unlike Bunny Guinness, quoted in the Daily Telegraph as saying, in response to the number of gardens making statements or forming part of a campaign, "I think people would prefer gardens that you might want to walk around, to actually enjoy,” I think that show gardens play a valuable role in pointing to future trends, and future trends will inescapably require us to consider water conservation and the changing climate. 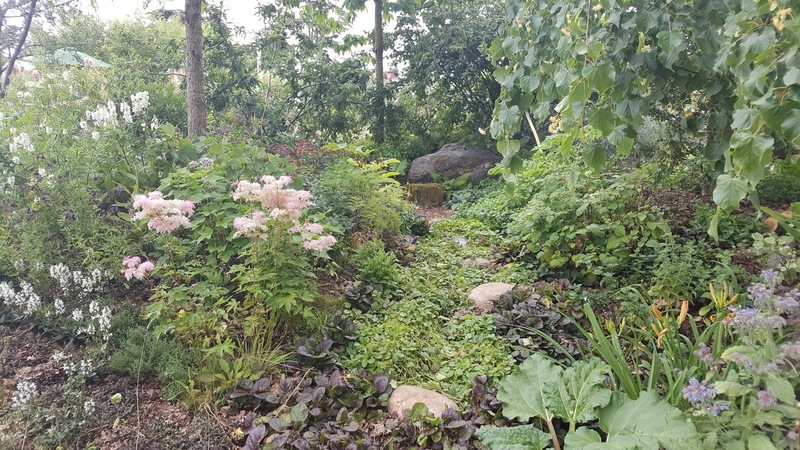 Gardens that are thought-provoking as well as beautiful, such as Rhiannon Williams' Urban Rain Garden, which won the People's Choice award in the Changing World category, and the Zoflora and Cauldwell Children's Wild Garden (Best in Show) can be highly rewarding for the visitor. 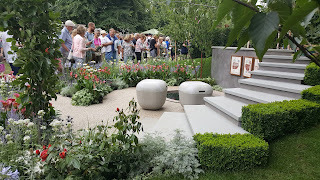 There were still plenty of gardens that were simply beautiful such as Andy Sturgeon's evolving planting for the RHS Watch This Space garden, above, the gardens of the USA, or VaRa Design's gorgeous planting for the Association of Professional Landscapers (APL) garden A Place To Meet, below. The brick beds on the RHS Kitchen Garden, above, are a rather neater and more aesthetic version of my brick-built keyhole bed, which is currently housing my courgettes. I made mine from bricks rescued from skips in my neighbourhood, but I can see the appeal of using charcoal-grey blocks which blend in and set off the environment rather better. 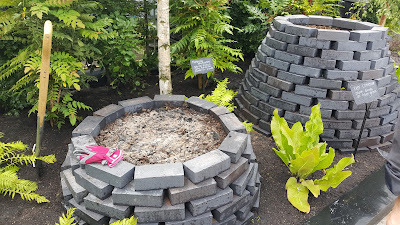 At the show, the RHS was promoting these hand-made beds as compost heaps, which one could enlarge simply by adding more layers, although I reckon it would be difficult to turn your compost in one of these. 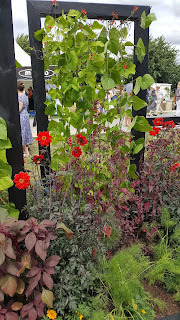 Also in the RHS Kitchen Garden, a new take on the runner bean wigwam. 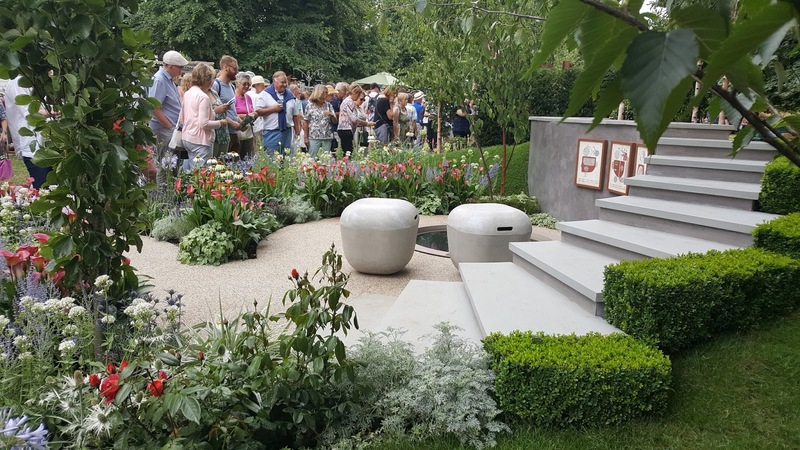 At On The Edge: The Centre For Mental Health garden, these highly functional concrete seats also include storage underneath. These could look great in an urban/contemporary setting. 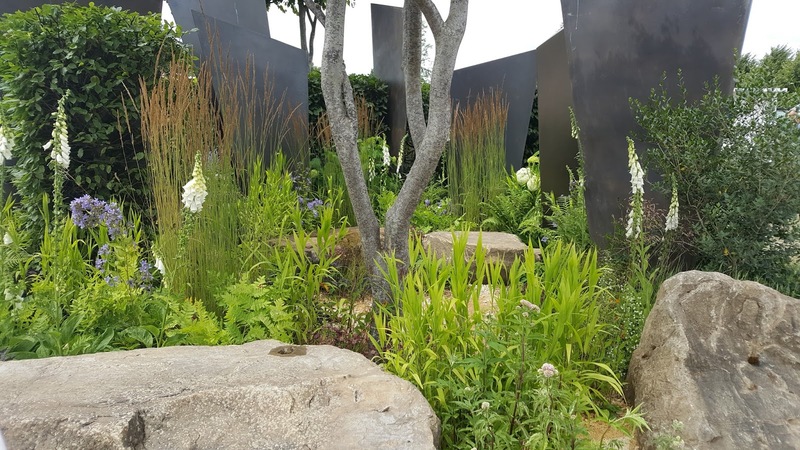 My own personal favourite among the show gardens was London Glades, by Andreas Christodoulou and Jonathan Davies, in the Changing World category. 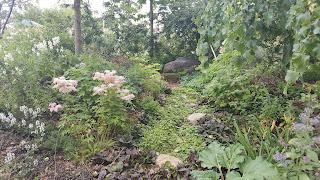 At first sight, it's a woodland garden, with mixed mature trees and some clever and unconventional underplanting (day lilies, rhubarb, vetch, all mixed together?). The wider significance becomes clear when you realise that every single plant in the garden is edible - it's a woodland potager. 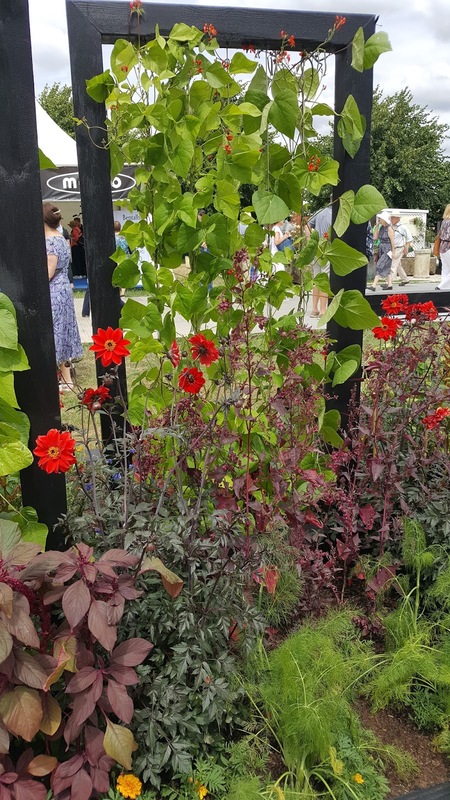 The designers clearly enjoyed sourcing unusual plants such as the Japanese pepper - you could hear a constant stream of questions from visitors: "What exactly is that? But which part of it can you eat?" 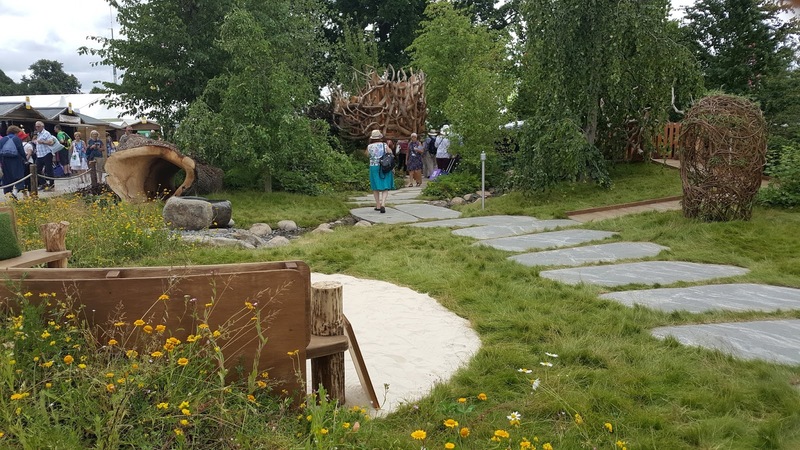 I overheard one visitor say to her companion: "It's not very realistic, though, for an urban setting, is it?" and I couldn't disagree more. 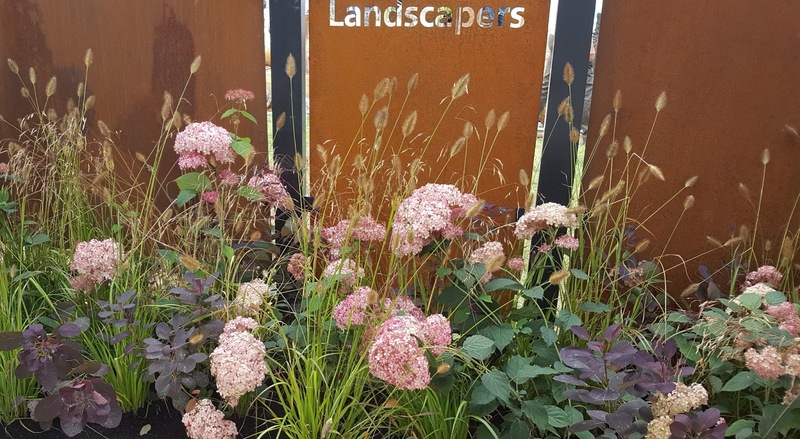 I can think of so many town gardens with that problem shady patch, probably somewhere down near the shed, or in the shadow of a tree that also helpfully screens a bit from the neighbours. 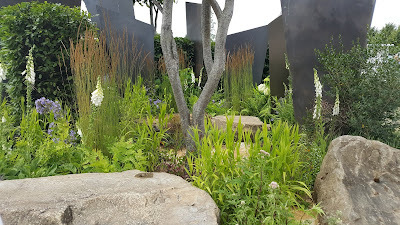 Or down the side return ... And this is definitely a interesting way to plant it up that doesn't look apologetic, nor relies on an indestructible Aucuba, or Fatsia. Deservedly winning Best in Show and the Peoples Choice award, the Zoflora and Cauldwell Children's Wild Garden by Adam White and Andree Davies, was created for children with disabilities including ASD with play areas, a secret cave, edible plants and safe secluded spaces within it. And these gorgeous smooth sawn slabs of stone creating a path running through the length of the space. 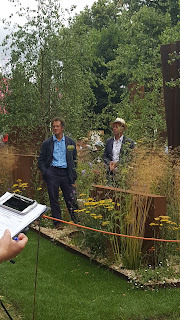 Monty Don and Joe Swift presenting in the Brownfield Metamorphosis garden by Martyn Wilson, landscaped using mostly corten steel and concrete and visualising a post-industrial garden, with clever planting using plants which readily establish in an urban environment: Buddleja, Achillea, Verbena bonariensis, Betula and various grasses.